Here’s a fun book you may enjoy. It could inspire you with new ways to teach your child about living green. Or it may make a great gift for another parent that you know who could use some help in the eco-department. 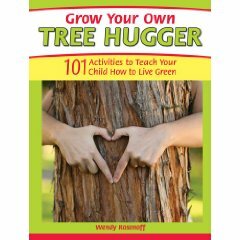 by Wendy Rosenoff is full of activities, crafts and recipes that can easily teach children about the environment and about being green without being preachy. Some of the activities sound like so much fun your kids won’t even know they’re learning. are: basket weaving from twigs found in the yard, gift wrap made from maps and sheets of music, craft stamps made from wine corks, memory jars, and an old favorite tie dying old clothes into something fun and new. There’s also some yummy recipes: King Cake Surprise, edible dominoes, fruit salad in a watermelon, moon phase sugar cookies and sunflower gelato cake. I’ve read a lot of “green your kid” books and this one has to be one of the best- it makes everything fun. Which is great because when it comes to kids serious doom and gloom isn’t going to win you any points.